Antenna "BAS-2301 WiFi" is designed for outdoor placement and works in conjunction with WiFi routers that have external antennas with circular radiation pattern in a zone of uncertain reception of Wi-Fi signal, providing an increase in the coverage area of Wi-Fi to several times in the chosen direction. 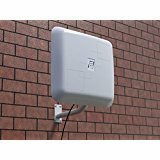 Antenna housing is made of ABS plastic which protects from UV rays and most adverse weather, prolonging the service life. "BAS-2301 WiFi" can be installed on the mast or bracket diameter up to 50 mm, allowing more precise adjustment in the desired direction. Idea outdoor WiFi Extender; Great for Offices, Stores, Warehouses, Restaurants, and other places. If you have any questions about this product by REMO Electronics, contact us by completing and submitting the form below. If you are looking for a specif part number, please include it with your message.